A wonderful ode to a lost parent I think. On Tuesday, Pandora founder Tim Westergren published some interesting numbers in a sort of confusing company blog post. According to the post, Pandora pays out a decent amount of money to thousands of artists – some of whom are well-known, such as Adele and Lil Wayne, and some of whom are barely on the mainstream radar, such as Donnie McClurkin and French Montana. According to Westergren’s post, Pandora is on track to pay $10,000 each to over 2000 artists, $50,000 each to over 800 artists, and millions of dollars (between $1 and $3 million, but when you get that high does it really matter?) to artists such as Coldplay, Adele, Wiz Khalifa, Jason Aldean, Drake, and Lil Wayne. In fact, Westergren states that artists whose sales rank on Amazon very low – such as Donnie McClurkin (4752), French Montana (17,000), and Grupo Bryndis (183,187) – will each earn over $100,000 from Pandora performance fees this year. These numbers almost make it sound like Internet radio is a viable way for an otherwise struggling musician to make a decent living. However, it’s important to realize that when Westergren says Pandora is paying a certain amount to artist, what he actually means is that Pandora is paying a certain amount per artist. 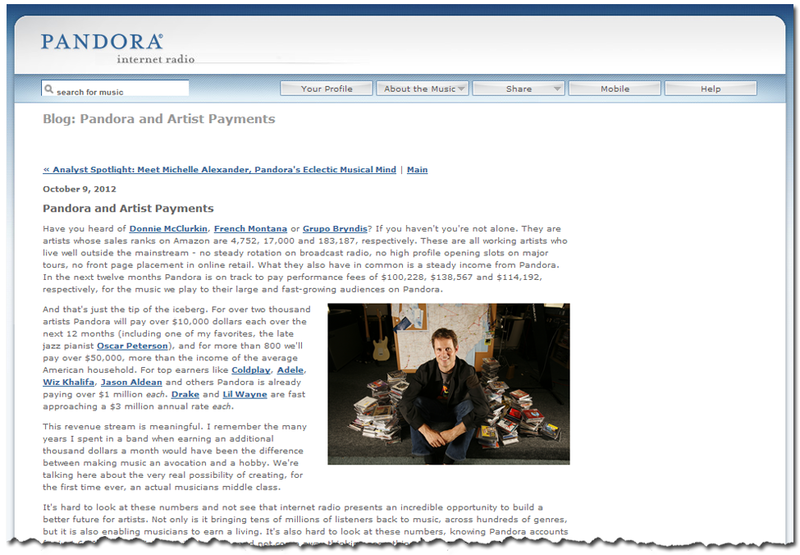 In other words, it’s unlikely that artists are making $10,000 – $3 million from Pandora – this money is, of course, divvied up among a number of people, including the artist, the record label/copyright holder, and SoundExchange, which is a non-profit performance rights organization that collects and distributes royalty fees from Internet radio services. Still, even after the record labels and SoundExchange takes a cut, the artists are probably making something from Internet radio – after all, Pandora is just one revenue stream, and it accounts for a mere 6.5 percent of radio listening in the US. Basically, Westergren wants you to take a look at these numbers, sit down, and really think about this question: If Pandora accounts for just 6.5 percent of radio, why is it paying some artists (and their record labels, and SoundExchange) hundreds of thousands, or even millions, of dollars? Well, there is an answer to that question, and it is: Because of the ever-present Recording Industry Association of America (RIAA). According to Westergren, the RIAA and its lobbyists in Washington have “devastated” Internet radio. Westergren blames a predatory licensing fee lobbied on Internet radio (as opposed to traditional radio). He points to the fact that major broadcasting companies (including Yahoo, AOL, LaunchCast, and MSN) even “fled the business” after the latest rate hike was imposed. Forbes correctly points out that Westergren’s post is a bit controversial. After all, he starts out spouting impressive numbers that make Internet radio seem like an artist’s (or, at least, a record company’s) dream. Then he turns around and asks those same artists to take a pay cut for the sake of Internet radio. But Westergren’s point of view is understandable, and even laudable, though his presentation is perhaps a bit clunky. What Westergren wants is a fair licensing structure for Internet radio – similar, though perhaps a bit pricier, than what traditional radio gets to pay. Internet radio currently pays artists more money than other forms of royalty-paying media, because the RIAA is, and has always been, extremely wary of the Internet. There are several reasons for this, but the main reason seems to be obvious: The Internet facilitates more direct artist-to-listener communication, which helps cut out the middleman, or the record labels and the RIAA. The RIAA is also concerned with how the Internetfacilitates illegal file-sharing, though they’veyet to come up with a workable strategy for combating this (so far, suing users one-by-one for millions of dollars and backing controversial anti-piracy bills such as the Stop Online Piracy Act hasn’t worked out too well). It’s an interesting proposition, and one that I don’t entirely disagree with. Though I definitely support artists earning money for their songs, I do think that the pricing for Internet radio – Pandora pays about 55 percent of its operating budget in licensing fees – is too high to support innovation and growth in the industry. Remember, these artists aren’t giving up a fulltime job, as Pandora is just one revenue stream. For example, if Drake makes $3 million – heck, if he just makes $1 million after various people take a cut – from Pandora, he still makes money elsewhere, from other music discovery services, concerts, personal appearances, endorsements, etc. If a small-time artist makes $10,000 from Pandora, that same artist likely makes money from gigs, appearances, and other online and offline radio services. I think life acquires most of its meaning from having connections with something larger than yourself, whether that is family, friends, your God, your country or other, and trying to add something good to something beyond yourself. I’ve touched on this before. In other words showing love and hopefully being loved. Love those close to you, and treasure your time together. It doesn’t last forever. We have had a death in my sister’s family to remind us of that. This is one of my favorite songs, and passages from the Bible as well.